Just like our campaign Don’t Change Much, we’re all about small steps, and this time we’re being rewarded for it! 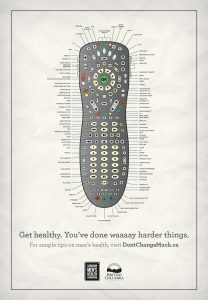 The CMHF has claimed an award for our hilarious print ads, which are featured in the highly coveted Communication Arts Advertising Annual. 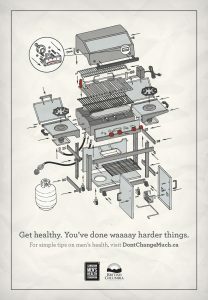 Aimed at motivating guys to visit dontchangemuch.ca for simple tips to get healthy, these print ads remind men that: you’ve done waaaay harder things like learning to use a complex remote, assembling a barbecue or shelving unit. 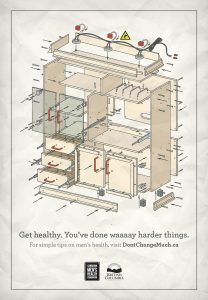 A special thanks goes to Rethink Communications for lending their creativity and services to this campaign. Now, we want to hear what you think. Have a look at the ads and leave a comment for us below!